Jackets for Highland, Scottish attire. Jackets for Highland, Scottish attire*. and also some Military style doublets. Pipers, drummers plaids and half plaids. and to accommodate the NZ standard of not wearing waistcoats (or vests). 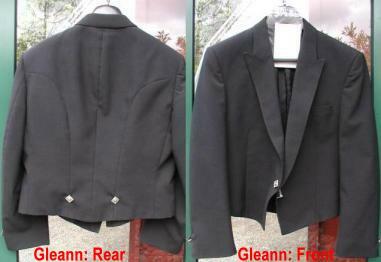 * Jacket styles also suitable for Irish, Welsh, Cornish dress. More suited for winter conditions. This style is worn with a waist coat. Rear view of Prince Charlie jacket. No jacket - just waist coat for summer comfort. Our primary style for summer comfort. Side/rear view of Craill jacket. We use black woollen barathea in standard and medium weights. Prince Charlie have the standard short tails as illustrated. On the Prince Charlie these follow the Officers Mess jacket styles. We use satin facings as standard. For Crail and Argyll we use the current conservative fashion style to ensure longetivity of use. A button hole is included on the lapel. NB. NEVER pin a button hole arrangement to the satin facings of a Prince Charlie jacket. These are standard with the Prince Charlie jackets; are an option for Crail or Argyll jackets. Bow Ties to match the jackets are included.